Since Republicans took control of the House, Senate and the White House, an additional 4 million people have become uninsured. 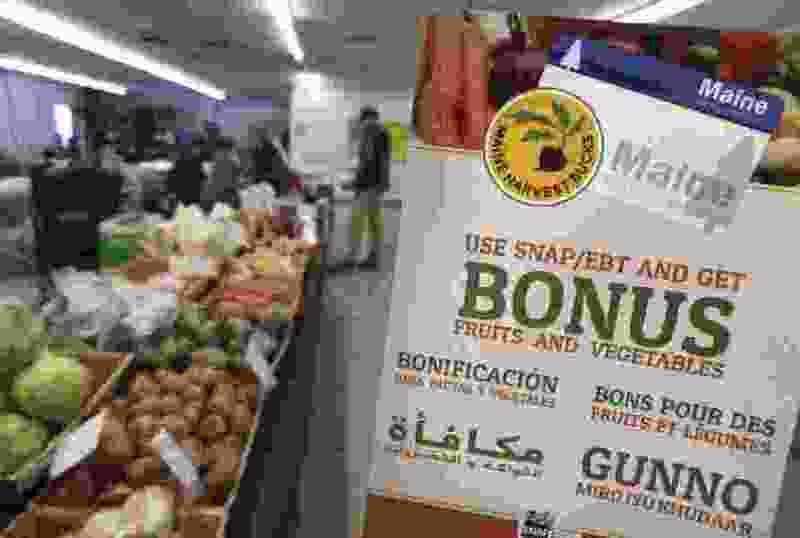 (AP Photo/Robert F. Bukaty) In this Friday, March 17, 2017, photo, a sign advertises a program that allows food stamp recipients to use their EBT cards to shop at a farmer's market in Topsham, Maine. After the birth of my son, I can’t tell you how many times my husband and I would imagine what it would be like for families who must decide between meals and boxes of diapers. How lucky I felt to have a job that offered unpaid leave so that I could be with my babe for the first three months of his life, and how fortunate I was that with my husband’s job and a tiny savings, we were able to afford it. I thought a lot of my own mother. She raised me by herself on a teacher’s salary and I know she knew where every dollar in her paycheck went, a value I hold dear. Last week, I called Rep. Chris Stewart’s office in Washington, D.C., to express my concerns about changes, cuts and work requirements that are being proposed to SNAP, the Supplemental Nutrition Assistance Program, as part of the Farm Bill. I asked where the representative stood on these proposals and received a response that I found deeply troubling. He was still deciding on a program that is the first line of defense against hunger for 16,000 households in this district? In Utah, 80% of SNAP participants are families with children in their homes. More than half are working families struggling to find jobs with wages that allow them to put food on the table. On Friday he voted yes to jeopardize this program and fundamentally change SNAP. The Farm Bill failed to secure enough votes to move out of the House. SNAP is good for families and good for our communities. I’ve found our representative is out of touch with the experience of everyday Utahns, particularly children. The impact of poverty on children is uniquely devastating and destructive. Make no mistake, there is a very high cost to keeping children poor and hungry. Investments in programs that reduce childhood poverty and hunger save our country many dollars in the long term and help raise stronger children. As I look at the efforts Stewart has led over his three terms in office, I have to ask: Are our families a priority for him? Our Utah families often rely on what is already a very weak social safety net in this country. Are any people, including children, the elderly and disabled among them, a priority for him? Stewart recently tweeted that Utahns should be seeing savings of about $3 a month in our power bills as a result of the deficit-financed GOP tax bill. That’s $3 worth of good news, and there is always a cost associated with it. That cost is affordable health care for Americans. President Trump has now requested that CHIP, the popular and low-cost Children’s Health Insurance Program, take a $7 billion dollar cut. That’s half of the entire budget for this program that serves 9 million children and pregnant mothers. Since Republicans took control of the House, Senate and the White House, an additional 4 million people have become uninsured. A woman I spoke with in Escalante told me of her challenges accessing health care coverage. She works three jobs, provides for her children and suffered leukemia as a child. She needs ongoing care, but she simply can’t afford the ever-increasing cost of coverage, so she lives in pain. What are Stewart’s plans for this mom and every person who lives in pain without healthcare? I’m running for accessible and affordable health care for every American and I also believe in a bold vision of the future where no child in this country goes to bed hungry. Programs like CHIP and SNAP are not handouts. They are critical steps on the path to self-reliance. Our Utah families need someone in their corner in Washington. All families need someone advocating tirelessly for everyday freedoms from the ballooning costs of health care in this country and for a future where every child has meals on the table. A future where every mother and father can take their child to the ER without fearing medical bankruptcy. Utah families are my priority. I would work with anyone, from any party, to implement the solutions that matter most to our families.